Jack: And Jack Bosch. And we are a husband and wife team, business partners, best friends… I hope so. Jack: All legal crimes. No crimes whatsoever and welcome to the Forever Cash Real Estate Podcast where we talk to you about all things in real estate investing with a particular focus on tax delinquent real estate, land flipping and areas where the owners have not paid their property taxes. So whether that will be tax liens, tax deeds or our own three proprietary methods where we go around the tax lien or tax deed auctions and buy properties directly from the owners whether it be land, whether it be houses or where we do stuff like we buy properties before the auctions, let them go to auctions, and then collect over just after the auctions. No matter what, most of what we do in our real estate world has to do with tax delinquent real estate investing. So over the last few years, as I mentioned also in last week’s podcast, we have done a whole bunch of deals. We have done over 3,500 deals going on 3,800 deals and we love it. It’s something that… we love dirt, we love houses, we have portfolio of real estate properties of houses and commercial properties and other things. They come all with their little things all the time, like right now we have the deal where apparently somebody is living in one of our garage and squalling there. Michelle: In one of our rental properties. Michelle: Nothing that cannot be solved. Jack: Nothing that cannot be solved. And we just love the ins and outs of real estate. So since we have done 3,800 deals and we had time periods where we sometimes had to make something like 1,000 offers a month or more than that, we have developed a pretty slick process to make a lot of offers in a short period of time particularly in the land area and this process is what we want to talk about today. Jack: And that’s by the way, Michelle just walked you through the basic steps of what it takes for example do a land deal or actually get a land deal accepted. It’s a really simple process yet there are multiple steps in it. Most people are trained to do exact that way that Michelle just explained. We are trained to look at something in a very linear process where you basically say, “Okay, let me take this and let me go down that path until I am done with that project and then let me go take the next project and go down the path to that next project,” right. That’s kind of like how in school we’re trying to do. We’re not trained to go to things in the way more of like Henry Ford did things. So like before Henry Ford, everyone did basically… You went to a tailor and he measured you, he selected the clothing, then he cut the clothing, the fabric. And then he cut the fabric, and then he started sewing the thing together, and then delivered your suit, and then he started the next suit, right? If you went to a cook, he goes starts cook your meal at a restaurant. He starts your meal, he finishes your meal and brings it out to you, and then he starts the next meal, right? Jack: That’s very normal that the world thinks like that but then Henry Ford came out. And Henry Ford, while apparently as a person, not being necessarily the most uncontroversial person but he at least found… What he did well is he basically realized that by splitting up the tasks and specializing in certain tasks or at least having one task being done a thousand times before you move on to the next task, he was able to produce a lot more in a lot less time, which obviously saved cost and save the effort and so on. And so the way we did this when… or the way we do this nowadays or when we transitioned it to that way, initially we did it the same way. We would get one call and we would start doing the research on that property and then we would send out an offer. Michelle: …Prepare my letter, my sale agreement. Jack: Prepare a sale agreement, and then send it out in a mail and the only thing we perhaps did in bulk is we sent three or four sale agreements a day out in the mailbox because we wouldn’t go to the mail office, to the post office for every single one of them. We would stack up, and then in the evening we would go to the post office. As we increased the volume, that stopped being possible. So we had to transition to a more Henry Ford kind of model. Instead of taking it a vertical approach of going step-by-step by step-by-step, we needed to do a horizontal approach. Michelle: Originally, it was done by us exactly, by yours truly. And then when once that entire process anywhere from 100 to 200 properties is done, then we move unto the next one, which would be to actually come up with a dollar amount. And once all the dollar amounts were in those 200 properties, in those 200 records, I would pass that on to somebody that would then go ahead and mail merge all the sale agreements, all the letters introducing the sale agreement, and would actually then in bulk stuff and stamp and bring to the post office and mail. And so we went from basically, like Jack explained in the beginning, having a vertical process to a horizontal process where we went by station. It was like different stations for each of those different things that needed to happen in the process of getting enough out to one of our sellers. Jack: Exactly right. So the beauty of that is that when you do that, as Michelle just mentioned, you literally focus on one activity for a chunk of time. That’s why we call it chunking. And that also helps human nature because it’s proven by scientists that even though we think we can do multitasking, we really can’t. Our way of multitasking is to do a lot of different things one after the other and we think we’re doing them all at the same time. No, we don’t. Have you ever watched…? I watched football like a few weeks ago and I was sitting there and I was working and I had to turn the audio off while I was working because I thought I could do both at the same time. And sure enough while I was working, and even with the audio off or with the audio on while I was working, I wouldn’t pay attention to what you’re saying or I couldn’t focus on the other thing. It just doesn’t work to do both at the same time. So with this, you get to use your human nature to its potential and get to focus on one thing, get into that one mindset of finding comparables, that one mindset of verifying sizes or looking at all the individual things that are necessary before you make an offer. Michelle: Accomplished much more. And you have managed your energy much, much better, yeah. Jack: Right. And you have basically… you have been in different zones. Now whether you do this yourself or you hire somebody to do this for you, that’s the key to getting more offers done faster. Michelle: Yeah, and especially when you hire somebody else to do this, what is great is that when you hire them to either verify and do the research for you and get all the links, you can overstaff, you can train in waves all of those people at once. And then you can go ahead and move on to the people that are actually going to help you with doing the comp analysis or the value analysis and you can hire those people all at once, train them all at once, you know what I mean. And your ramp up period, in terms of outsourcing or delegating these tasks and getting the number of offers that you want out per week or per month, whatever your goals are in terms of sales or profits per property that you’re looking for, you’re more than likely to reach them and meet them if you go with this horizontal approach. Jack: Right. 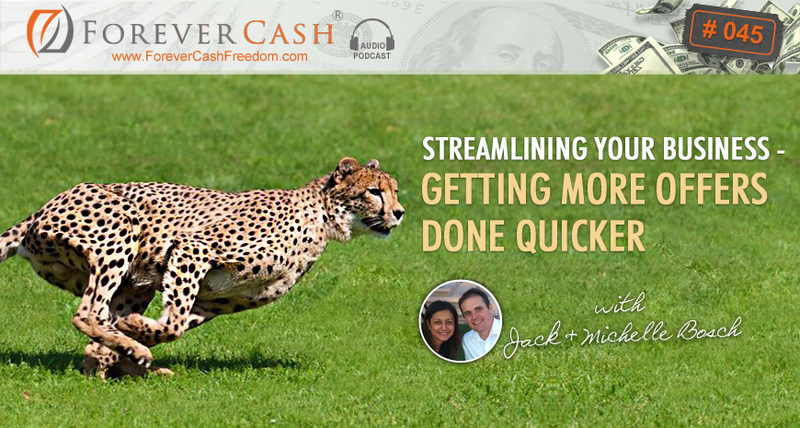 And we know that particularly from an example also from… This is a question we get quite a bit from people like, “Jack, how can you do…?” or “Michelle, how can you do 100 offers in a day?” Well, the answer is very simple. Michelle: It’s not me, the person; it’s the process that is beautiful. Jack: Exactly, it is very simple. The offer-making process takes several days but the offer making only takes two minutes per property. Jack: So as a result, I can make offers on 30 properties an hour and in 3 hours and 20 minutes I am done with a 100 offers. As a matter of fact, that’s a long time. We actually think… 100 offers should be made in an hour. But you can only… you can make 100 offers in an hour if you have right in front of you the research on 100 properties that was also done by somebody focusing on that aspect of it for one period of time. Michelle: And that information is presented to you in such a way that it’s all there in one spot so that you can go in this horizontal approach versus vertical. Jack: Exactly, you don’t have to go look around for additional information that’s missing on an ongoing basis. All the information was already put in a format that you can see on a spreadsheet like you still do it. Michelle: Or in a software. Jack: Or in a software. But even the software for the actual offer making, we are exporting the corresponding data out of the software just for the task of making the offer, and then importing it back or we just hand entering the amount into the software so that the software then can take it to the next step. But I like having a spreadsheet in front of me. We have 100 properties with all their details listed right next to each other or one above the other grouped. Not only that, but also grouped by state, county, and within the county by area or by subdivision so that similar properties get similar offers. If you have three properties all are in acre in size, all in the same subdivision, all the same assessed value, all the same market value, guess what? They all three getting the same offer because it’s land. Remember, when we’re talking about this land? In the housing world, that’s probably a little bit different. The offers need to vary based on condition of the property but in this case, what’s the condition of a land? It’s land, it’s land, it’s land. So you just make the same offer on all three. And now instead of taking three minutes per property, it takes 30 seconds per property to make such an offer. And then you move on to the next step of mail merging them all at once and sending them all at once. So the key, whether you’re one person or whether you’re 10 people in your office, don’t have everyone go vertical on one property at a time. Instead, have one person or have one task of doing all the property analysis, meaning if one person checking all the sizes, have one person do all the comps, have one person… whether it’s the same person in a different day of the week, it doesn’t really matter. But have one task being done get the comps for 100 properties, get one task, get the links to the topo map or to Google Maps for all 100 properties. And then have it put all into one spreadsheet so you can actually see it, and then you go and make 100 offers in a couple of hours. That’s how it ultimately works so that’s how you can get volume done. And that’s how Henry Ford also did it, right? They have one person in charge of just making front lights, right? One person in charge of just making steering wheels or even in the assembly part. Even if they didn’t make the steering wheels themselves, one person was only in charge of creating, of putting the steering wheels into the car and making sure the steering wheel sits well and is screwed on well and runs well. They did steering wheels all day long and while that is boring sometimes if you do it all day long, I trust that in your business you’re not just going to do one thing. You got to do a few different things so there’s some variety in there. But volume can be created by going horizontal instead of vertical. Michelle: Absolutely. And, hooray for process. Jack: Hooray for process. So with that, wanted to again thank you for the podcast. Again, we have a free gift available for you. It’s actually free, what we call a demo account. We have a new website that is called www.MyOpenPath.com. There is literally thousands of hours of real estate online marketing and business building training inside. You can set up a free demo account, 100% free demo account. We don’t even ask for your credit card, free demo account. With the demo account, you get four complete courses for free plus you get to download the audio version of my best #1, Amazon #1 bestselling book, Forever Cash. And also you get to take all the other courses on a test drive and check them out and get full access all around the website. You can navigate all around this program. So if you want to check it out, the very least, set up for the free demo account and get those four courses plus the audio book. I would love that. So again that’s www.MyOpenPath.com. And on the top right, there’s a little link that says ‘Start For Free’ and that’s where you want to click on to set up your demo account. And with that, I want to say thank you. Jack: And you all have a wonderful, wonderful rest of the week, and we’ll talk to you next week.